Not the most summery of recipes I must admit, but then it hasn't been the most summery of summers. 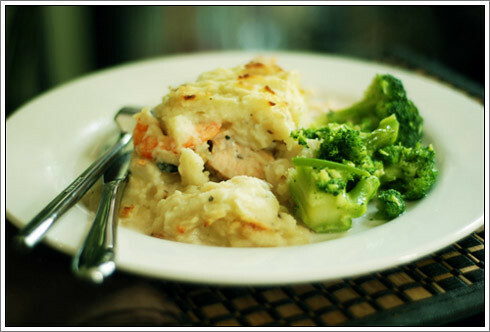 Fish pie is perfect cold weather comfort food. For me, a major plus is that it's a meal that is easily prepared in advance so you can just pop it in the oven when you're ready. I made this as my other half's dad came to stay and I didn't want to be knee-deep in the kitchen on a friday evening after work. I like to keep my fish pie simple with nothing more than fish, a white sauce and potatoes, however if you wanted to make a really decadent fish pie, you could add slices of hard boiled egg and some delicious asparagus to the mix before you top it with mashed potato. My sister once made a version topped with sweet potato which was divine, so there's many variations you can try. Peel and chop the potatoes into chunks, then boil for 20 minutes or until cooked. While the potato is boiling, place the salmon and cod fillets in a large, deep frying pan, add 100ml milk, 100ml white wine and then enough water to make sure half the fish is covered. Add the bay leaves and grind in a little pepper. Simmer with a lid on for 10-15 minutes until the fish is cooked. Remove the fish from the pan and place on a plate to cool. Do not discard the liquid - you'll be needing it shortly! Drain and mash the potatoes, remembering to add the remaining milk and half the butter, and season with pepper. Cover and set aside for the moment. Next, make the white sauce for the fish: over a low heat melt the butter and once melted, stir in the flour and cook for a further 30 seconds. Add the liquid reserved from the fish a tablespoonful at a time, stirring constantly to avoid any lumps, until you have about 300ml of liquid and stir in a teaspoon of mustard. Break up and arrange the fish in a 20x30cm or similarly sized dish and scatter the prawns, mussels and squid on top. Pour over the white sauce so the fish is covered, then spoon on the mash - I use a fork to spread it out, which also creates a lovely ridged pattern which in turn crisps up beautifully in the oven. Bake at 180°C for 45 minutes to an hour, then serve with something green on the side.